Hello everyone! Today is Qixi Festival, Valentine's Day in China. It's one of the traditional holidays in China on July 7th in the Moon Calendar. Just like the Valentine's Day in western countries, lovers always spend this holiday together with roses, nice dinner, and gifts. The festival originated from the romantic legend of two lovers, Zhinü and Niulang. Zhinü, who was the seventh daughter of the Goddess, just escaped from "boring" Heaven to look for fun on Earth and fell in love with Niulang, who was a cowherd. They were married and had two children without the knowledge of the Goddess. When the Goddess found out, she became mad and forbid Zhinü from returning to Heaven. On Earth, Niulang's ox suddenly began to talk and told him a way to find his wife. Crying bitterly, he killed the ox, put on the skin, and carried his two beloved children off to Heaven and found Zhinü, angered the Goddess even more. The Goddess scratched a wide river in the sky to separate them forever, but once a year all the magpies in the world would take pity on them and fly up into heaven to form a bridge over the stars, so the two lovers can be together for a single night. That's where the Qixi Festival comes from. What a lovely story! Chris and I never celebrate Qixi Fextival together, so we decided to celebrate this year since we are currently living in China. Usually on Qixi Festival it will be raining, which is interesting. We always say the Earth is so happy for them that it cries on this day. But who knows why? It's well known that people in China like wearing red, especially during holidays. So I chose to wear my dark papaya skirt from J Crew and my favorite white blouse with a heart in front. For shoes, I wore one of my favorite summer dress sandals from Trina Turk. However, I had trouble deciding which purse I should wear, the Mab Tote Mini Cross Body from Rebecca Minkoff, or the Kate Spade Sedgewick Place Phoebe. Chris helped me out and I finally chose the pink mini tote from Rebecca Minkoff. Since this is our first Chinese Valentine's Day, I decided to cook a nice dinner for Chris. 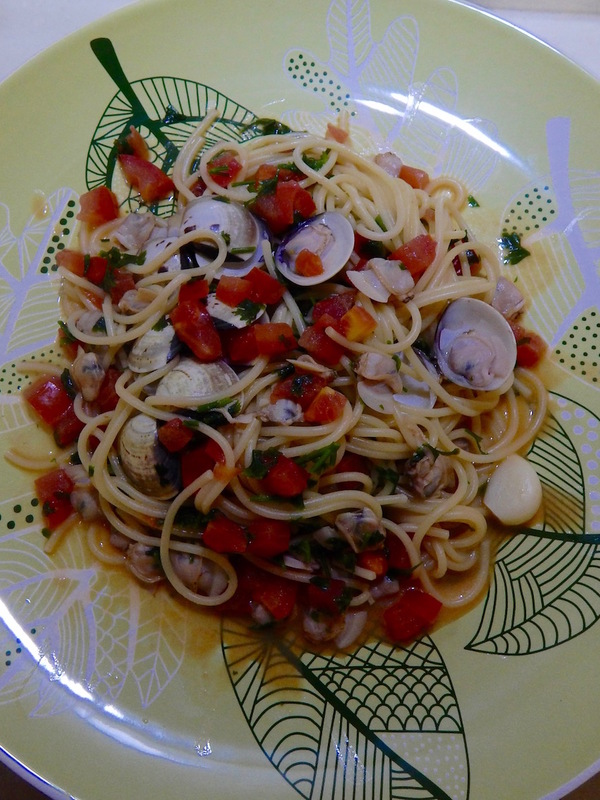 I cooked the clam spaghetti as the main course with seafood salad as the side. I also cooked a chocolate cake as the desert. Thanks for reading my blog today! I wish everyone tons of love!